“In [Western] medicine, we believe that one hormone can fix a problem as complicated as obesity, one neurotransmitter can fix something as complicated as depression, or one DNA strand can heal a cancer,” said Daphne Miller, MD, before a packed audience at the Ferry Building earlier this week. 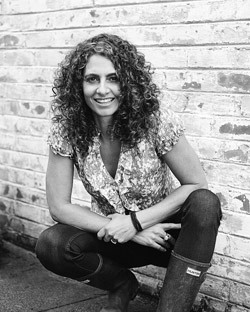 Jaded by modern medicine’s emphasis on isolating symptoms rather than treating the whole patient, Dr. Miller went back to the land to inspire her practice and set out on a journey to visit farmers who are eschewing business as usual. 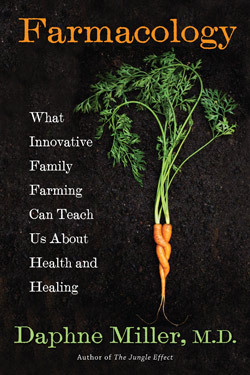 She shares her stories and discoveries in her new book, Farmacology: What Innovative Family Farming Can Teach Us about Health and Healing. In her travels, she met Erick Haakenson of Jubilee Biodynamic Farm, who transformed a depleted plot of land into a thriving vegetable and fruit farm. As a beginning farmer, Haakenson at first followed the conventional “test-and-replace” method of soil management, sending samples to a lab for testing and then adding nutrients and minerals to compensate for deficiencies. After dumping some 50 tons of amendments in the earth and seeing little progress, he turned to the holistic farming methods of Biodynamic pioneers such as Rudolph Steiner. He traded in nitrogen-based fertilizers for cows and compost and started farming in concert with nature’s cycles. Over time, he was able to build healthy, bioactive soil yielding vibrant, nutrient-dense plants. Dr. Miller shared a parallel story from her medical practice. A patient named Allie had shown up at her office plagued by exhaustion and gastrointestinal problems, caught in a diet of energy bars, prescription pills, and over-the-counter supplements. Rather than take the test-and-replace approach that many of Allie’s previous doctors had used, Dr. Miller prescribed lifestyle and diet changes such as subscribing to a CSA program and gardening. Just as Haakenson’s farm sprang back to life, Allie’s health improved. Like any farm or ecosystem, the human body is greater than sum of its parts, and according to Dr. Miller, the similarities between farm ecology and human health run deep. For example, the ideal pH and the carbon-to-nitrogen ratio in humans and soil are almost identical. The interplay of micoorganisms in healthy soil is not unlike our own human microbiome. And where do those carbs, fats, and proteins that compose our bodies come from? The food we eat and the soil it’s grown in, naturally. Eat a little dirt (and even a couple bugs). If you’re eating from healthy soil,don’t scrub your vegetables. The nutrients and beneficial microorganisms are not just in the food itself, but they’re also in what the food was grown in. Conversely, unhealthy, chemically treated soil can contain toxins. Buy with your nose and taste buds, not with your eyes. Pick your food up and smell it. Smell is an indicator of nutritional value, and good food should smell good. If it doesn’t smell, it might be because the seed it was grown from was selected for productivity or ease of transport instead of taste and nutrition. Food that comes from sustainable agriculture might look imperfect, but those bug-nibbled bits can be the most nutritious and delicious. Choose food that has a story. Know the faces behind your food. Wendell Berry says a good way to find healthy food is to ask whether the farmer lives on the land. Farmers who live on and eat from the land, and who want to pass it down to their children and grandchildren, are more likely to take care of their soil than farmers who live off site. Cook. Put simply, cooking is a way to get to know your raw ingredients and connect with the farms. See Michael Pollan’s new book to learn more about why cooking matters. Give back to the soil and farms. Even if you live in the city, you can contribute to the soil cycle by joining a composting program, so your greens go back to the farm. You can also conserve water in the home, so that it can be saved for agricultural use. Bring the farm to you. Whether it’s tending a vegetable garden or bringing plants into your school or workplace, being around plants can actually make people happier and healthier (a phenomenon known as biophilia). Treat your body and your house with things that you don’t mind finding in your food. Sunscreens with lauryl sulfate and paint with VOCs not only enter our bodies through our skin and lungs, but they eventually wind up in our water supply. Those chemicals make their way back to the farm and ultimately into our food. Enjoy fermented foods. Instead of taking expensive probiotics in pill form, eat fermented vegetables. Fermentation is controlled rotting that uses the beneficial bacteria that live on foods and in the soil they were grown in. Ferment vegetables yourself or support a local fermenter. You only need a tablespoon a day to support healthy microflora in your gut. Learn more about Farmacology. Listen to a recording of the talk here. Photos courtesy of Daphne Miller, MD.